I have been searching online for navy handbags over the past month as I'm using my navy Canonbury Clutch so much but have been finding it too small at times - especially when I want to bring my good camera out with me. This beauty from Dune called out to me for just £39.99 - down from an original price tag of £70. Now it's not leather - though it took considerable hunting for labels to confirm this - it really is made of an excellent pleather. So it breaks my golden rule of not buying non-leather bags but what sold it to me was the similarity to the Miu Miu Matelasse tote - which I'd drooled over last year on my 40th present hunt. This particular handbag is not available online - but there are a few other Dune totes on this link. I did dither over this Paul Costello leather shopper in navy but it was very plain in comparison and a bit too wide but it's priced really well at £59.99 from an RRP of £225 and it most definitely *is* leather. But I didn't stop at just the handbag...oh no....my friend Emma (who blogs here) reminded me over a coffee yesterday how great TKM is for sunglasses, so I had a quick look as my favourite grey M&S ones have gone missing. There was an good selection of well priced options from Superdry, Cole Haan & Kenneth Cole to name a few but I opted for a pair priced at £9.99 (RRP £39) from a brand I've never heard of - guaranteed to not make me cry when they're lost or squashed as they are likely to be by the end of the summer. The UVA & UVB protection was highly rated and I liked the simple lines and neutral colour. Not really a brown, or a grey...somewhere in between...tho I appreciate they look black in the photo! 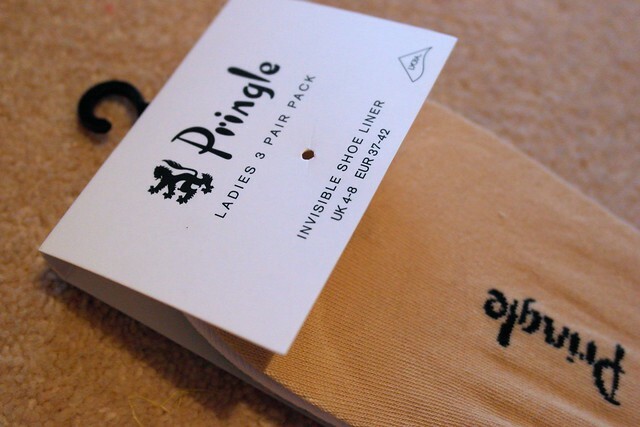 The last purchase was a till-point one - these shoe liners from Pringle were snapped up - £4.99 for three pairs..perfect for easing your feet back into wearing ballet pumps again. I like that they have a silicone detail around the heel to keep them from slipping off and they are a cotton mix to allow the feet to breathe. I wore them with my Gap metallic pointy flats all afternoon and it was virtually impossible to see them around the edges. I did a good job of ignoring the shoe department...I could see these beautiful flats (also from Dune) calling to me but I resisted..just about! Gorgeous bag - great style and colour. Gosh that bag is SO like the Miu Miu Avril - great find! 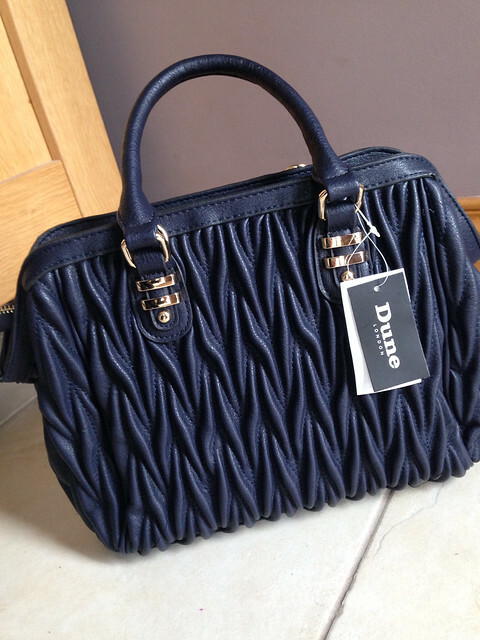 Lovely bag....I bought the stone one in 2012, still going strong and looks fab. 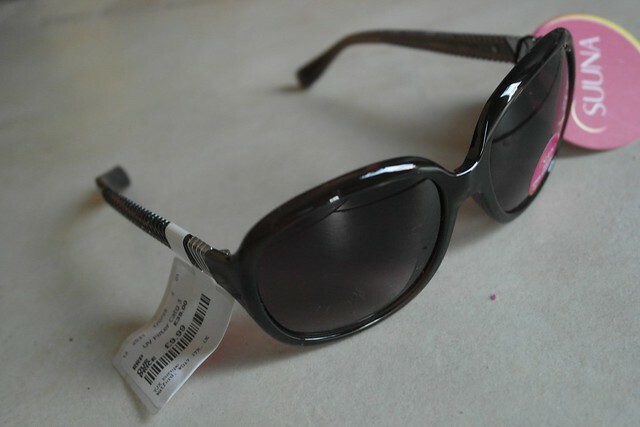 LOVE TK Maxx and I always buy sunglasses when I go in - why pay £100 when you can pay £20 for designer there? Now I really really love that bag, beautiful! I need a navy one! Love that bag. Amazingly like the miu miu one & gorgeous colour . Also has a real Smythson look to it. Love it! !